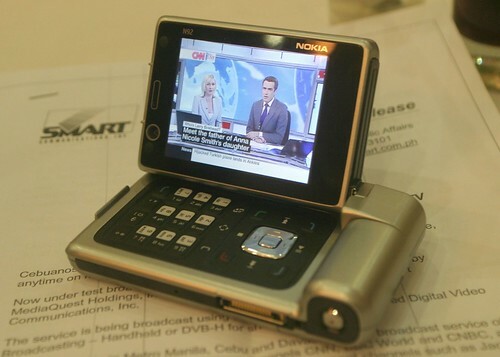 For less than the monthly subscription fee of a cable TV connection, you can now watch digital TV anytime and anywhere on compatible mobile phones. Smart Telecommunications Inc. and 360media launched on Tuesday myTV, a service that allows people to view high-quality TV broadcasts on their phones. The quality of the video is really great, it’s better than the quality of the SkyCable feed, on a bad day, to the unit next to my newsroom cubicle. Unlike the current prevalent video streaming and downloading service, myTV does not use the cellular network to transmit the video. It is broadcast, similar to how regular TV receives images via an antennae. MyTV uses the Digital Video Broadcasting-Handheld or DVB-H platform for broadcasting. For P488 a month, Smart subscribers can view CNN, MTV Philippines, Cartoon Network, National Geographic, Pinoy Box Office, History Channel, Solar Sports, Basketball TV, ETC, and Jack TV.